As always, Tuesday is Game Day here at spalanz.com, and today promises to be something…different. 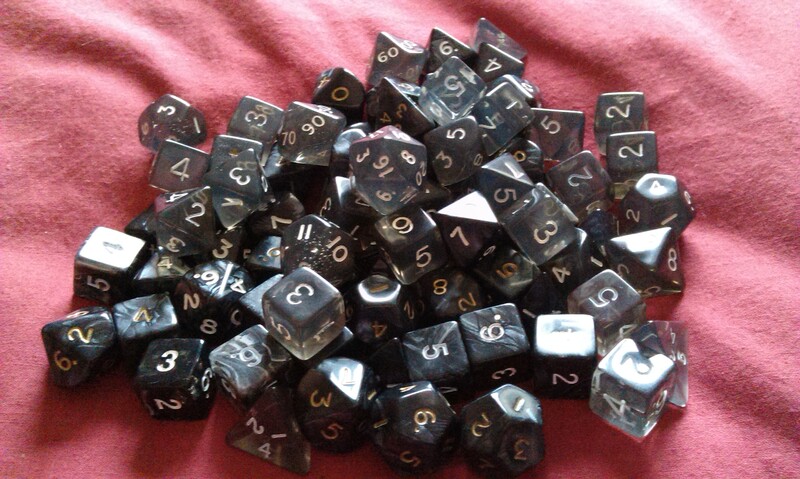 For months now, I’ve been posting about games on here, with lots of pictures of the components, and an overview of why I like them and whatnot, but today, I’m taking a look at a Role Playing Game. Indeed, the Role Playing Game – at least, the only one I’ve ever been able to play! 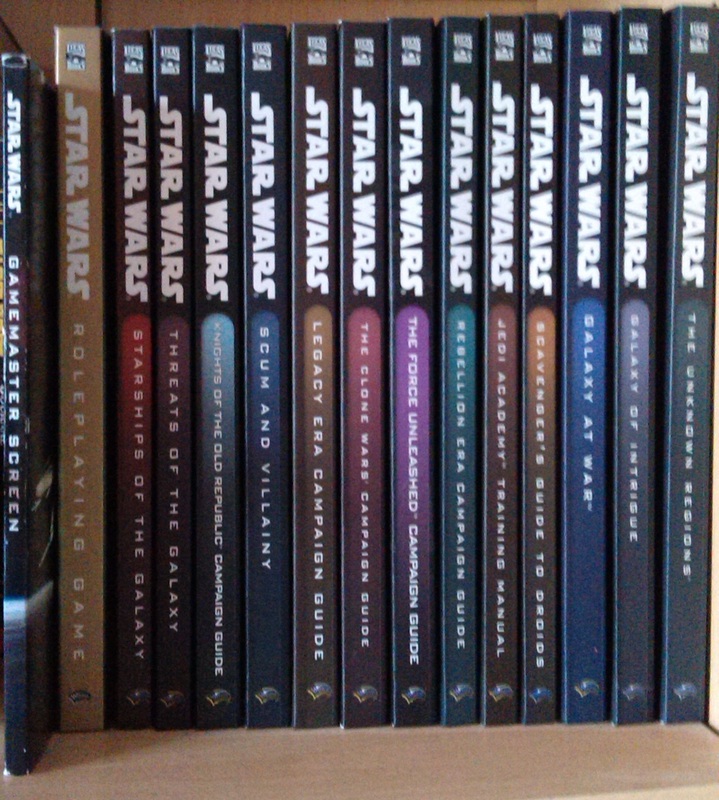 Today, I’m looking at Star Wars: Saga Edition! The first question I asked myself when I was preparing this blog was: Why am I doing this? 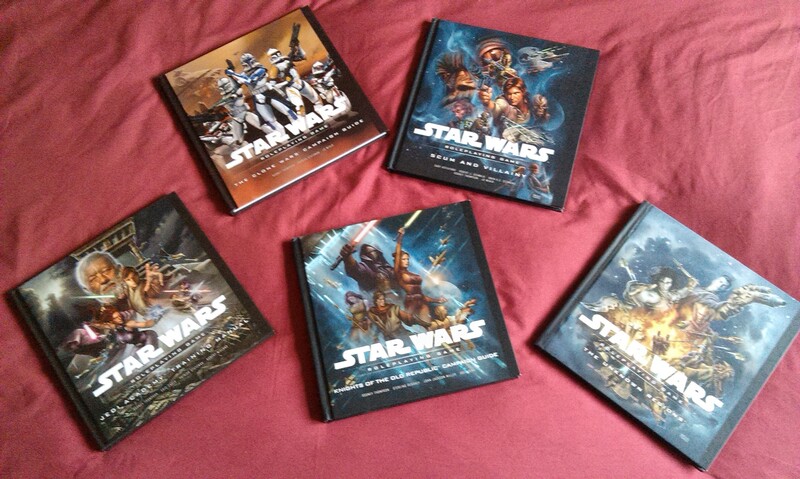 All of the other games that have featured on my blog have been in-print, but Star Wars Saga Edition officially ended over four years ago. As such, it can be fairly difficult to come by – especially if you actually want a new book. However, one of the reasons I do these game day blogs is to talk about games that I love, and it would be remiss to not include this game, because I love it! For the uninitiated, Role Playing Games are actually really awesome. You need a good Games Master who is more concerned with storytelling and ensuring everyone has a good time than with the rules being correct, and you need a group of people who are somewhat invested in the story and their characters than they are in just goofing around, but all the same, when you get the right mix of folks around the table, it can be really magic. Prepare for a couple of hours of being lost in your imaginations! Ah! Basically, a Role-Playing Game is a game where you play a character but, rather than moving that character around a board, you tell the story of what you are doing. In a very real sense, it is an experience akin to telling stories around the fire, or whatever. One person in the group plays the Games Master, who is nominally “in charge” of the proceedings. Something that is very important here is that the GM is not the enemy. Yeah, he controls any enemies that you may face, but his role is better described as a referee. In short, the GM controls the world that you’re playing in. A good GM is one who is primarily concerned with everybody having a good time, and telling a good story, as I said back in June. He or she is responsible for everything that can happen, so you’ve got to be a hell of an improviser. When I played Star Wars Saga Edition, I was the GM, and as much as I loved it, it’s also hard work. Being responsible for the world the other players are playing in, it’s up to the GM to create the adventure that you play that week. To a large degree, you need to be able to account for all possible avenues the game can proceed along, so it’s no use in preparing just a linear scenario where your players must do x to then be able to do y, but don’t have the option of being able to do a, b or c, as you haven’t got notes for that. I’ll talk more about my experiences shortly, but it really sticks with me when I first took up the mantle, and my group decided they wanted to do something completely different to the adventure I’d prepared. Gah! So, as much as you’re telling the story, you’ve got to be prepared to let the story tell itself, also. Knowing your group will help enormously with this. It’s always best, then, to have a scenario prepared that you want to happen during the course of the session, but also have a host of notes on other stuff that could just as easily splinter off from that scenario. For instance, my first game involved the heroes having to make it off-planet in a ship, but they were completely disinterested in pursuing the option I’d prepared, which would make it easier for them to hire a ship, so I had to make my grizzled spacer captain into more of a pushy sort who was touting for business, and have him approach the heroes. Hardly a massive plot point, but without it the story would have never gotten off the ground (pun intended). GMing is a lot of work, but it can be immeasurably rewarding, as well. And if those notes you prepared for potential side adventures aren’t used, they’re never wasted, as the situation may come up when you want them in the future. Always keep everything! Each of these are scored, and from this your character becomes good at certain skills. There are two big influences on these attributes and skills: species and class. For example, in Star Wars, Wookiees are really strong and really dexterous, so have high scores in these two attributes. Classes denote what you do, with classic examples such as Mage/Priest, Cleric, Ranger etc, and these will also lead you down a certain route as regards your attribute scores and, subsequently, your skill scores. Once you’ve got your character set up, and you have a fair idea of what he or she is good at, you’re ready to play the game! Checks? I hear you cry. Well, this is where your skills come in. In order to do something, you need to check if you can do it. For example, in order to see if your character noticed something, he needs to make a Perception check. This is done by rolling a die – in the case of Star Wars Saga Edition, all skill checks involve rolling a twenty-sided die, or d20 – and adding your skill score to the result. If you equal or exceed the difficulty class (DC) of the check as set by the GM, you pass. As I said above, depending on how the GM is running the campaign, you might have to check for everything, or you might only have to check for certain things, such as when you’re in danger. As an aside, I would often make my group make Perception checks seemingly at random – “You’re walking down the broad central street of the town. Make a Perception check. All done? Marvellous. So you’re walking down the central street…” – but a lot of this informs the GM on the level of detail you give to your group. If someone beat the DC of the check, then any subsequent attacks aren’t entirely a surprise, or whatever. 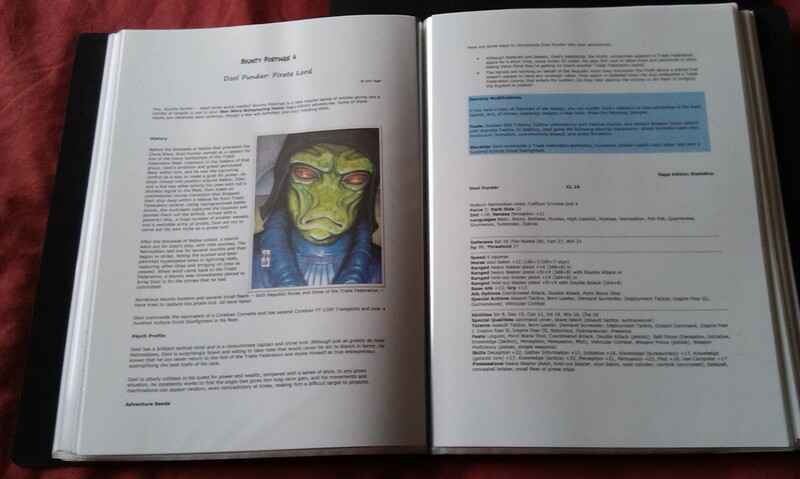 Perception checks are one of two checks that you’ll most often find your characters making in a RPG such as Star Wars Saga Edition; the second is the Initiative check. While Perception measures how much the characters are aware of their surroundings, Initiative determines the order in which things happen – most commonly, attacks. Good RPGs will have a mixture of intrigue skills, information-gathering, and combat. Even bad RPGs will still have combat, however. This is where your Strength and your Constitution attributes come into play – your Strength will determine how good you are at attacking, and your Constitution determines how much damage you can take. A wide variety of weapons is often available, and these will add bonuses to your dice rolls, as well as special effects such as being able to ignore armour and the like. Your basic Strength score will, of course, determine how good you are with your bare hands. Attacks can be where people confuse the role of the GM with that of the enemy, as the GM is controlling any non-player character (NPC), most often these being your adversaries. While the players are rolling their dice in the open, some GMs can be quite maddening, making their rolls behind a screen, and constantly making little notes here and there. However, there is always a purpose! Mostly, it is to ensure the encounter runs reasonably as planned: if you intend for the heroes to fight a boss’s bodyguard in order to impress him into giving the players some information they need, it’s no good if said bodyguard kills all of the players in the first round of combat. As a GM, I have often fluffed my rolls in order to make a game run more smoothly. So we’re not cheating – we’re actually helping! When players successfully overcome challenges, whether they’re fights or something else, they most often gain experience points (XP), the amount being dependent on the challenge level (CL). These go to form a bank, and when a player reaches a set amount, he can go up a level. In Star Wars Saga Edition, there are 20 levels a player character can achieve, and each one comes with all sorts of boons, from simple bonuses to attributes, to increased options for skills and even classes. Especially in Star Wars, Jedi characters cannot learn certain Force powers if they are not of a specific level. Levelling up your character is one of life’s true joys! So that’s RPGs in a nutshell! Star Wars has seen many incarnations of role-playing games, starting with West End Games back in the 80s. 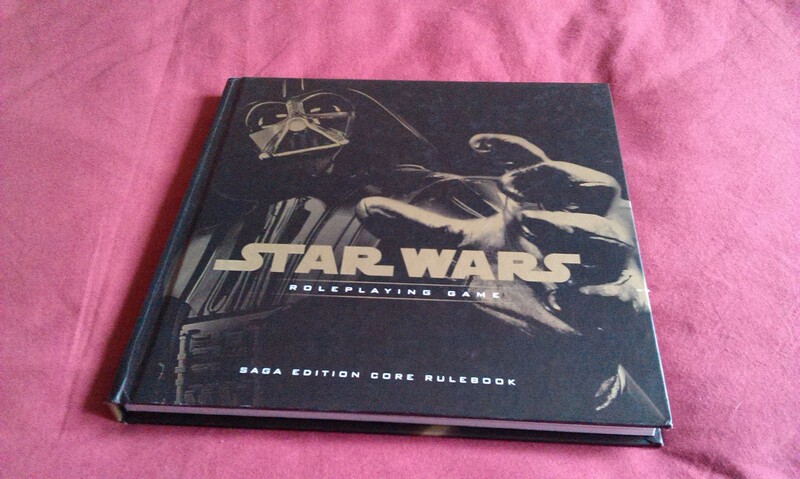 Saga Edition was published from 2005-2010 by Wizards of the Coast, who held the Star Wars licence from the late 1990s. It was their third iteration of the RPG, and the fifth version of Star Wars role playing to that point. Wizards of the Coast are perhaps most famous for their Dungeons & Dragons line, which has just recently entered its fifth edition. Saga Edition is based very strongly on that game’s 3rd edition, so in that respect it is very similar to the Pathfinder RPG. 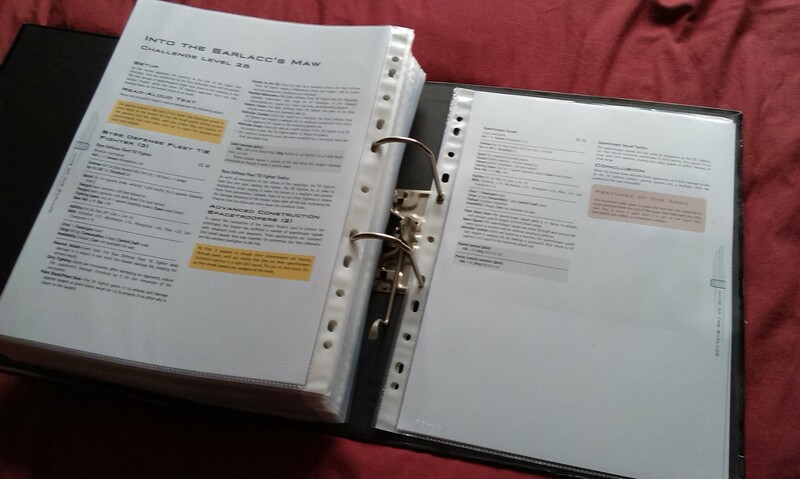 Over the course of the run, fourteen hardcover books were published, giving the rules for different eras in the timeline as well as specific classes etc. You’ve hopefully picked up on the notion that RPGs involve a lot of written content, with the GM becoming something of a writer, producing characters and locations and encounters in order to create a successful game. In order for any of these to function in the game, they need stats – NPCs need stats to at least be able to fight the heroes; locations need stats to interact with the encounters that take place there, which in turn have DCs based on what precisely is going on, which all go together to produce XP for the players. Now, GMs can do all of this, sitting alone amid piles and piles of books, making sure they have all the information to hand to know exactly how effective Darth Vader is in combat. Or the game designers can just tell you how effective Vader is in combat, leaving the GM free to come up with an exciting story as to why the heroes come up against him. It’s not exactly about just getting free stuff, though, but about a company producing loss-leaders. 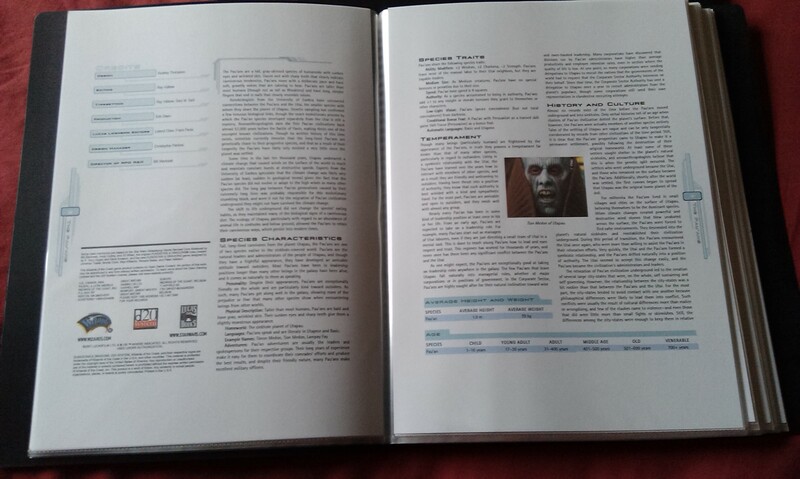 For example, Wizards released the Knights of the Old Republic Campaign Guide in 2008, and accompanied it on their website with a host of additional content such as stat blocks for a variety of creatures and hardware that didn’t make it into the book. 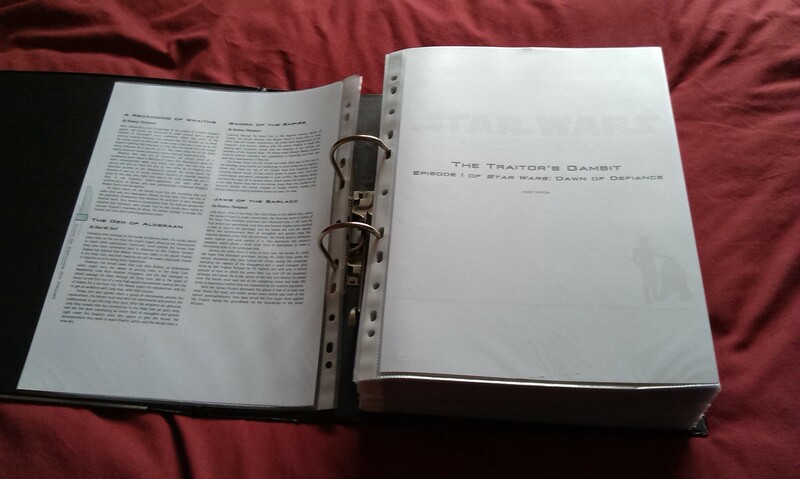 That stuff was made for free and, while the odds that a KotOR book wouldn’t sell well when the video game was still a hot property were very slim, it nevertheless creates something of a hype when a company has free stuff on their website, but you need to get the campaign book itself to make maximum use out of it. It creates fan goodwill, and increases the chances of people buying into the game if they can see that game is well supported. Initially, then, Wizards were producing all sorts of stuff like this. 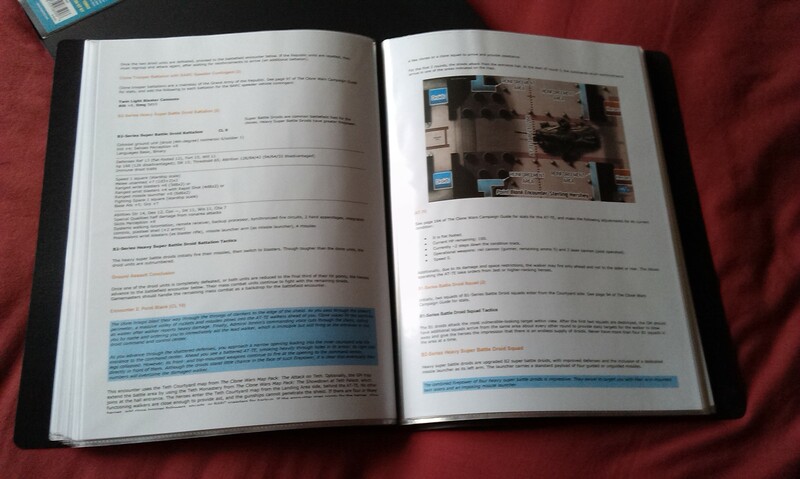 The RPG also made efforts to cross-fertilise with the Star Wars Miniatures game, a skirmish game where players fielded armies of miniatures and basically tried to wipe each other out. When a new batch of miniatures was released, stat blocks would go up online to allow players to use the characters in their RPG games. Indeed, Wizards did originally seem to have in mind that people would use the miniatures and the maps to play the RPG, but that died a death. Something really impressive about the level of support Wizards initially gave Saga Edition was the amount of new stuff that became available for free. I’m not just talking about new ships you can use, or new NPCs you can fight – they even gave us new species we could use. Character options like this are phenomenally useful! 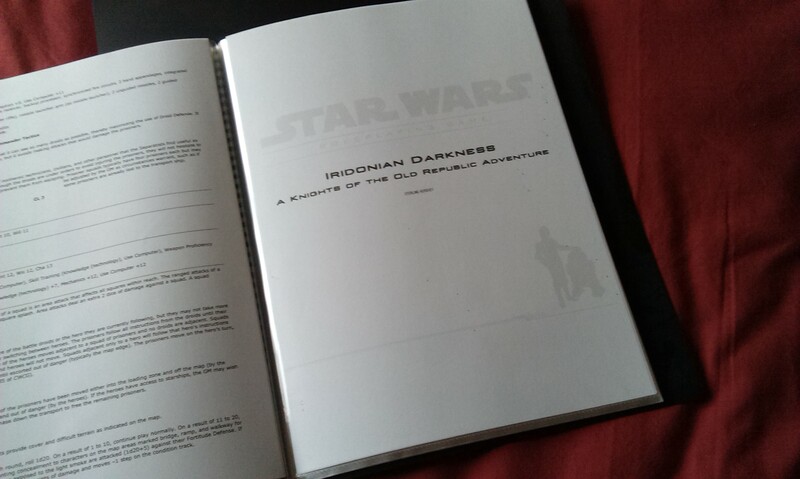 They also gave us scenarios and campaigns on the website, including Irridonian Darkness as another KotOR tie-in. Luckily, a lot of this content has been preserved by the fans, as it is really top-notch, but when the gave up the licence to produce Star Wars games, they obviously had to cleanse their website of all content. The jewel in the crown of all this, for me, is the Dawn of Defiance campaign. A 10-part campaign that was designed to take players all the way from level 1 to level 20, it first appeared in November 2007, and it was all for free. Support like this really impresses me, and makes me want to play in this system. And I’m not the only one, of course. Companies don’t always get it, and Wizards certainly lost their way towards the end of their run, but a well-supported game system will be well thought of by the fans, and attract increasing numbers to it. However, Wizards just seemed to lose interest in the licence towards the end of their run, something that particularly came out in the miniatures game, but also in the uneven quality of the last few books for the RPG. I’ve expressed quite a lot of negativity towards Wizards over the years, all based on the way they handled the licence in their last year with it. Officially, they “ran out of ideas” as to what they could do for new content. A strange excuse for a creative company, but anyway. The miniatures line suffered, and the RPG stopped seeing web content. However, their final book, The Unknown Regions, was perhaps a fitting end for the run, as it gave GMs the tools with which to generate any sort of situation they could ever think of. So, while I have been disappointed in the past, I must admit to being really impressed by the way they ended the game. I love role playing games, however, and can never let my feelings for how a company handled a game from letting that game speak for itself. Role playing games are just such a wonderful way of playing games, allowing you to exercise your imagination, tell stories, and even act out at times – it’s just so much fun! Star Wars is an incredibly rich and vibrant world, and getting to play in that world is just far too much fun sometimes. Getting to create your own character and living within that world, even if it’s just for a couple of hours a week, can be an amazing experience, and I can recommend it to anyone. RPG communities are unlike regular game communities. They’re places of creativity, where people go to share ideas, as well as experiences. In this way, it’s also interesting to note that RPGs never truly die, even when the company has stopped supporting it officially. You can meet people all over the world who are still playing Star Wars RPGs using the West End Games version from 1987. Saga Edition has had a lot of support in the five years it was being published, and it still retains its place on my shelf even when I haven’t played it for months. Previous Previous post: The Tomb Stalker!